Time, space and causation are like a glass through which the Absolute may be conceived. There, neither time, space nor causation exsist. Time concerns us all; humans, animals, matter, and the whole universe; all are in its grip. Everything suffers from 'the bite of time'. Time is all pervading. We all live under its power: Human self-consciousness is inseparable from time. Man lives in time, he is aware of time, he reckons with time. Time is the matrix of all distinctions. Every human activity or experience, whether physical or psychological, social or environmental, is inexorably linked with the passage of time. Experience of the passage of time lies deep within. In the depth of a full mind, distinction can be made between the Real and unreal. There, time, kāla, is experienced as neither merely objective nor purely subjective. The concept of 'real time' is not possible within a dualistic vision. Kāla is not manifested in terms of space, distance, course, orbit, way, or journey (the Adhava's); but through kriya-action, work, and doing; involving specific passage of time and time duration. This aspect of time is colored by influences described by Jyotish astrology as connected to the chemistry of nature. Samaya: Right time(s) for doing anything involving the study of energy and force in time space. The ancients regarded the entire universe as a living organism, continuously changing in its manifestation. From dawn to dusk and from dusk to dawn, everything changes. Change is the basic law in creation. Motion was seen as a sequence of events to which times can be assigned, that is, time was regarded as the outcome of motion, rather than motion as the outcome of time. The present review aims to elucidate these ancient concepts of time and gain a comprehensive understanding of them. 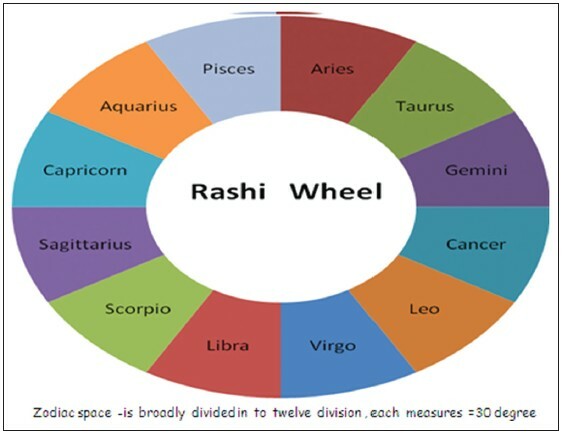 The ecliptic is divided into 12 equal divisions called Rashis or 'signs of the zodiac'. The 12 signs are also known as the 'limbs of the year'. In Jyotish, they are held to give time a form, each 'limb' endowing time with a different quality. They thus constitute a heavenly body, the body of the cosmic 'time person', or Kāla Purusha [Figure 2]a and b. In addition to the 12 signs, Jyotish further divides the ecliptic into 27 'Nakshatras' [Table 1], each sign containing parts or the whole of three Nakshatras. The 27 Nakshatras each span an angle of 13°20', making up in a full circle or 'Nakshatra wheel' (13°20' × 27 = 360°) [see [Figure 3]. Each Nakshatra is thus a region of space associated with a group of stars, the name usually referring to the brightest star in the group, and to the nondecaying current from that domain of time-space. So each planet rules over three Nakshatras. 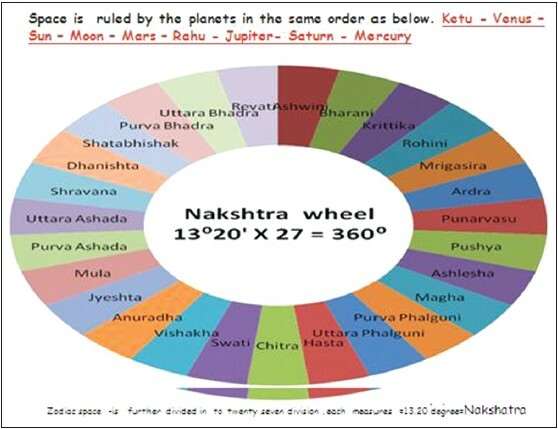 [Table 1] names the 27 Nakshatras and their controlling planets in three cycles of nine, the order is the same as that of the 'dasha' time periods by which the planets govern a person's life. The word Nakshatra means 'one that never decays'. Nakshatras exert a protective watch over the soul continuing over many lifetimes. In its monthly cycle, the Moon spends roughly 1 day in each Nakshatra. The tradition states that the Nakshatras are the daughters of Daksha and Kashyapa Brahma, and wives of Chandra. Rotating round the sky each lunar month, the moon spends one night with each in succession. This expresses the idea that each Nakshatra possesses a different quality of energy field, which is transmitted to earth through the moon each Nakshatra day. Each Nakshatra is connected to ancient myths and gods. Each has its own prakriti or individual nature, represented by a symbol, an animal sign, character traits, emotions, and spiritual patterns; as well as a color, vowel sound, and names. Each is made of many strands that include: Gunas, Doshas, and aims in life. Sattva is the subtle impulse ('va') of 'sat', the eternal, imperishable. Sattva is the subtle impulse of mahakāla within kāla; by becoming sattvic, man becomes empowered to return to the eternal. It is the food material for dwelling in 'the real'. Having the attribute of purity; 'Sat' also means 'being, existing, pure, true, and real'; 'sattva' is where purity dwells. A sattvic person values purity of being, thought, and action. An example of pure sattva is pure water. Vegetarianism is sattvic, because it rejects killing to fulfill the need to eat. The power of Sattva works on an abstract level. Rajas is the quality of taking action; the searching quality possessed by all human beings. It can be equated with 'pollen of flowers', moral, emotional, or mental darkness. 'Pollen of flowers' is the potential to create new flowers, just as humans activate new life; experiencing life and birth. 'Moral, emotional, or mental darkness' is the inability of people to find answers within themselves, and consequently to seek fulfillment in the illusory, material world. Rajas moves from the abstract to the practical. Tamas, the attribute of darkness, can also be translated as 'ignorance', making it plain that the darkness is mental. Mentally, tamasic people emphasize sensuality. They lack spiritual insight and knowledge, enjoying hedonist lifestyles, and focusing on sensual gratification. Vedic culture suggests that tamasic people escape from their ignorance through work and service. Tamas works on the practical level. Jyotish regards the whole existence as a singular unit spread over the canvas of space and time; past, present, and future. All appearance is manifested from the invisible 'seed force level' to the gross level of the matter world with its own cosmic order. Every individual moves under the influence of 'guiding laws of nature'. These are transmitted in consonance with the overall structure of natural law, from heavenly mansions revolving round the individual and celestial bodies in orbits round the sun (or earth), and felt as tendencies down below by human beings in their abode on earth. Astrology is thus a time-space science offering systematic explanations for differences in personality, talents, peculiarities, temperament, likes and dislikes, opportunities, and experiences; in short, how the worlds of man and cosmos are coordinated; how the workings of the solar world, situated millions of miles above us, direct variations in body and mind Prakritis, and are thus the key to understanding our life on earth; and how, when man acknowledges the cosmic source of his feelings and thoughts, the two worlds are brought into harmony and collaboration, so that man can return to his source and kāla be transmuted into mahakāla. The cosmic world is the ultimate source of all the various factors influencing our lives. From the sky and space, we receive varying qualities of light, air, heat, and rain. These factors influence the production of foodstuffs like fruits, vegetables, and herbs that are essential to human life. Plants receive the seed energy from space and transmit it to the bodies of those that consume them, just as mantras transmit the seed energy of spirit into the mind. Both augment the prana, one from without, the other from within. Cosmic time is perceived as cyclical, a never ending cyclical process, which is both repetitive and exhaustive. Each time cycle has three components: Sristi - creation, Stithi - continuation, and Laya - dissolution. Each cycle begins with creation, continues for a certain duration, and then dissolves into nothingness; repeating after a brief respite. The same divisions are found in a day: Each day consists of dawn, daytime, and dusk; finally dissolving into the darkness of night; similarly for individual life, consisting of childhood-adulthood-old age. The Vedic calculation of time comes from the sage Ganita who is mentioned in the Manusmriti and Mahabharat. He calculated the duration of each cycle in human years. He divided cosmic time into kalpas which is a day and night in the time and space of Brahma, the creator. Each kalpa is said to equal to 8.64 billion years (Vishnu purana). One kalpa consists of two arthakalps (4.32 billion years of each), which are a day and night of Brahma. Each arthakalpa is divided into 1,000 mahayuga's. Each mahayuga is divided into four yuga's namely Kritiyuga, Tretayuga, Dwaparayuga, and Kaliyuga. At a lower level, a Divine day equals 1 year upon earth, and is divided into two equal periods of approximately 180 days: Uttarayana, the period of increasing sun (or 'day') and dakshinayana, of decreasing sun (or 'night') [Table 2]. During Uttarayana, the sun leads, and dominant rasas are Tikta (bitter), Kashaya (astringent), and Katu (Pungent); and the strength of organisms increases (Grishma-Shashira-Vasantha ritu); during Dakshinayana the moon leads, and dominant rasas are amla (sour), lavana (salt) and madhura (sweet) all of which decrease growth of organisms (Varsha-Sharath-Hemanth ritu). 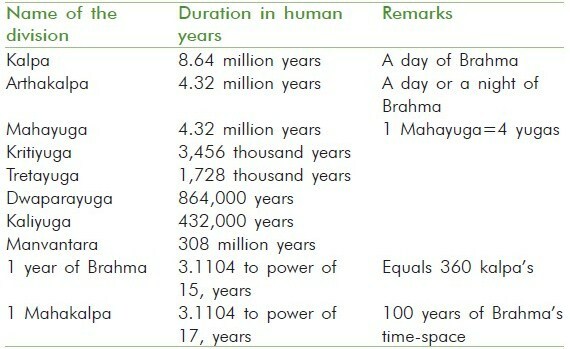 Vedic philosophy regards quantified time as an aspect of creation. We experience it only as long as we are bound to the things of this world through our senses. Time is a mental construct, created in every instant by our senses, and subjective perception. It is a part of the illusion which we take as real. In God's sphere, consciousness, there are no divisions of time. There is only the present moment, one continuous, indivisible, and indistinguishable state of existence-the 'eternal present'. who has awareness of prana, when practiced steadily, ageing time does not apply, that is, Absolute Being is felt." Time knowledge is a sovereign science, containing sovereign secrets; it is supreme, holy, most excellent, directly enjoyable, imperishable, an unmanifest divinity, and ananta (endless). The Upanishads propose the concept of maya. Only the Absolute is real. With reference to that, divisible time, in which change occurs, is 'unreal'. The whole concept of change is due to a misconception, an illusion, because the Real, the Absolute, is not in time. Rather the Seer is being absorbed into the Whole-mahakāla. Nyaya/Vaisheshika (NV) deals mainly physics, chemistry, and other material sciences including reasoning or logic and metaphysical studies, that is, search for knowledge of God. It is partly science and partly philosophy, dealing with nine elementary concepts: Earth, Water, Fire, Air, Aakasha, Time, Direction in space, Mind, and Atman. Definition: Time is inferred from the relation between past (Bhuta kāla) and future (Bhavishat kāla), discounting that of place. It is marked by association of an event with the sun's revolution and is measured by kshana, dina, ritu (seasons), ayana, samvatsara, etc., Kāla is an entity to be considered when dealing with chemical and physical changes. The mahakāla concept, central to Vedic conceptions of time, sets the entire structure of life and living in a different context from that of western science, or indeed almost anything in western thought. As the above examples show, it or a related experience, is an essential feature of the major systems of thought in India. The reason probably boils down to this: Whatever their intellectual persuasion, almost all originators of systems of philosophy in India were trained to experience the mind's silent depths. One of the easiest aspects of those states to experience is the 'sense of the eternal'. For this, steadiness of mind is required but is not the sole cause; the falling away of trivial concerns, and the expansion of awareness to wider perspectives and larger realms seems to open the door to feelings of eternity, as regular practitioners of appropriate techniques will attest. The above analysis of the conception of time in the Vedic sciences has been conducted following a series of scientific experiments testing various Jyotish hypotheses which yielded remarkable results. , Taken as a whole, the experiments provide consistent empirical evidence for the metaphysical effects predicted by Jyotish. Jyotish is often considered a 'Time Science', and the metaphysical forces with which it deals act directly on the Jiva or soul. In order to understand the scientific implications of these experiments more deeply, it is necessary to consider both the nature of time and the nature of the soul as a 'time-space vehicle'. In the foregoing, we focused on the former, the nature of time, as understood in the Vedic sciences, in order to see how it differs from the conception of time in modern western science. Jyotish differs from western astrology in that it is set in the overarching context of the Vedic sciences, those portions of Indian traditional knowledge pertaining to Vedic culture. The entire structure of Vedic culture was designed by its leaders, the Maharishis, to aim at spiritual liberation and immortality. All its 64 arts are designed to progress their students on the path to Moksha; their masters were were not true masters unless they were established in enlightenment. The structure of Jyotish is centered on the sequence Dharma-Artha-Kama-Moksha, the four types of 12 houses viz: 1, 5, and 9 (dharma); then 2, 6, and 10 (artha), going to 3, 7, and 11 (kama), and 4, 8, and 12 (moksha). The sequence indicates that natural law (dharma) is structured to bring the soul experience ranging from the physical, material to the metaphysical-spiritual; a journey from matter to non-matter. By gaining fulfillment (artha and kama) in this world, the soul can then gain liberation (moksha) from it, and find higher fulfillment in the next. Jyotish is thus concerned with the patterns of natural law that can promote progress on the path to moksha, increasing happiness, influence, and power at each step. Jyotish is specifically concerned with foreseeing influences that may create opposite effects before they arise and providing knowledge of how to avoid such influences, so as to eliminate obstacles on the path and make progress speedier. Its concern with growth to moksha makes Jyotish a supreme science. From the perspective of Jyotish, the key to progress on the path to Moksha is energizing the subtle body (Sukshma Sharira) with the correct planetary vibrations in accordance with a person's Jyotish constitution found from the Janma Kundali. This makes it possible to avoid malefic effects in life, and for the Jiva to gain the protection of the Kālapurusha, and rise to the level of the divine, established beyond space-time in mahakāla. For this reason, the Kālapurusha is often equated with the body of Lord Vishnu, the Vishwaswarupa, depicted in [Figure 2]b. In fact, all souls are under the command of the supreme purusha, purushottama, something all come to recognize as they rise to that level of consciousness. The specific concern of Jyotish is thus with the influence of subtle, planetary vibrations on the subtle body of the organism-human or otherwise. Certain vibrations will strengthen an individual, while others may weaken them. All organisms are subject to such influences, but humans are more easily able to go beyond them by attaining Moksha. Understanding Jyotish thus requires the ability to relate to and understand the metaphysical. Those progressing on the spiritual path and growing in the experience of the subtle, slowly gain the ability to do so. 1 Vivekananda S. Awakened India. Volume 90. Advaita Ashrama 1986. p. 38. 1. Monier-Williams M. Sanskrit-English Dictionary. New Delhi: Motilal Barnassidas; 2005. 2. The Time Concept Ancient and Modern. In: Vatsayana K, editor. New Delhi: IGNCA; 1996. 3. Nader A. Human physiology expression of Veda and the Vedic Literature. Vlodrop: Maharishi University of Management Press; 2000. p. 13. 4. Parashara M. Brihat Parasara Hora Sastra: Guide to Hindu Astrology. In: Sharma GC, editor. New Delhi: Sagar; 1994. 5. Vyasa V. Garuda Purana 2.5.147-149 and 2.8.28-19. In: Wood E, Subrahmanyam, Translator. Chareston: Bibliolife; 2011. 6. Vyasa V. Bhagavad Gita 2.20 Trans. Eknath Easwaran. New Delhi: Penguin; 1996. 7. Vyasa V. Bhagavad Gita 2.71 and 4.22-23. In: Easwaran E, Translator. New Delhi: Penguin; 1996. 8. Valmiki M. Yoga Vasishtha Ramayana. In: Bose DN, Translator. Kolkata: Firma KLM Publications; 1984. 9. Baidyanath S. Ritual time: An exegesis of time and great time. In: Vatsayana K, editor. The Time Concept Ancient and Modern. New Delhi: IGNCA; 1996. 10. Valmiki M. Yoga Vasishtha Ramayana. In: Bose DN, Translator. Kolkata: Firma KLM Publications; 1984. p. 60-1. 11. Parashara M. Brihat Parasara Hora Sastra: Guide to Hindu Astrology, In: Sharma GC, Translator. vol. 1. New Delhi: Sagar; 1994. p. 50-61. 12. Sutton K. Vedic Astrology. Kansas City: Viking Studio; 1996. 13. Parashara M. Brihat Parasara Hora Sastra: Guide to Hindu Astrology. In: Sharma GC, Translator. vol. 1. New Delhi: Sagar; 1994. p. 12-49. 14. Parashara M. Brihat Parasara Hora Sastra: Guide to Hindu Astrology. In: Sharma GC, Translator. vol. 1. New Delhi: Sagar; 1994. p. 111-32. 15. Vyasa V. Bhagavad Gita 2.20 Trans. Eknath Easwaran. Ch. 6. New Delhi: Penguin; 1996. 16. Frawley D. Ayurvedic Astrology: Self-healing through the stars. New Delhi: Motilal Barnassidas; 2007. p. 13. 17. Parashara M. Brihat Parasara Hora Sastra: Guide to Hindu Astrology. In: Sharma GC, Translator. New Delhi: Sagar; 1994. p. 640-9. 18. Raja Rao MB. Navaveda. New Delhi: Raja Rao; 1974. p. 226. 19. Samvid. The Essence of Yogavaasistha, 6 th ed. Chennai: Samatha Books; 2002. 20. Vyasa V. Bhagavad Gita 10.33. In: Easwaran E, Translator. New Delhi: Penguin; 1996. 21. Vyasa V. Bhagavad Gita 11.32. In: Easwaran E, Translator. New Delhi: Penguin; 1996. 22. Vyasa V. Bhagavad Gita 8.20-23. In: Easwaran E, Translator. New Delhi: Penguin; 1996. 23. Kanumalla VN. Vaishnava Creation Story. In: McCormik A, editor. The Mystery of Creation. Chp 7. Mumbai: CCMT; 2007. p. 63-4. 24. McCormick A. Mysterious Creation. Bombay: CCMT; 2007. p. 87. 25. In: Nikhilananda S, Translator. Subrahmanya-Iyer V. Mandukya Upanishad and Gaudapadakarika. Chennai: Sri Ramakrishna Ashrama; 1936, Sloka 1, 6-7. 26. In: Nikhilananda S, Translator. Subrahmanya-Iyer V. Mandukya Upanishad and Gaudapadakarika. Chennai: Sri Ramakrishna Ashrama; 1936, Sloka 21, 119. 27. In: Nikhilananda S, Translator. Subrahmanya-Iyer V. Mandukya Upanishad and Gaudapadakarika. Chennai: Sri Ramakrishna Ashrama; 1936, Sloka 8, 41. 28. In: Vasu SC, Translator. Kathopanishad II, 15. Delhi: Panini Office; 1905. 29. Laxmipathi A. A Textbook of Ayurveda (Ayurveda siksha). Madras: Arogya Ashramam Samithi; 1973. p. 15-8. 30. Laxmipathi A. A Textbook of Ayurveda (Ayurveda siksha). Madras: Arogya Ashramam Samithi; 1973. p. 113-4. 31. Lakshmi Thathachar MA. Concept of time from the point of view of Vishishta Advaita - Vedanta. In: Vatsayana K, editor. The Time Concept Ancient and Modern. New Delhi: IGNCA; 1996. p. 68-71. 32. Ramana M. Sat Darshan Bhashya Sloka 17 and 18, In: Vasishtha, Translator. 2 nd ed. Tiruvanmalai: Niranjanananda Swami; 1931. p. 87-8. 33. Ramesh Rao N, Renukaprasad C, Sharma S. Starting time dependence of yield in production of raniket virus vaccine: Natural variations in rates of microbial processes may have astrological explanations. Light Ayurveda J 2013;11:52-8. 34. Rao RN, Prasad RC, Byregowda SM. Can vaccine production yields depend on starting time? Part I: Anomalous effects consistently observed in two series of pilot experiments. Submitted to Current Science. 35. Rao RN, Prasad RC, Hankey A. The global effect of a solar eclipse on biosystems. Accepted for publication in the proceedings of the international conference on advances in electronics and information technology. Colombo, July 2013. 36. Ramesh Rao N, Renukaprasad C, Gajendragad M, Byregowda SM. Astromedicine: A summary of eight experiments. Light Ayurveda J 2013;11:42-7. 37. Hankey A. Science meets Astrology? Light Ayurveda J 2013;11:14-6. 38. Ertel S, Irving K. The tenacious Mars effect. London: Urania Trust; 1996.